In partnership with Leighton O’Brien, WildcoPES can provide all the solutions you need to ensure optimal fuel quality at all times! 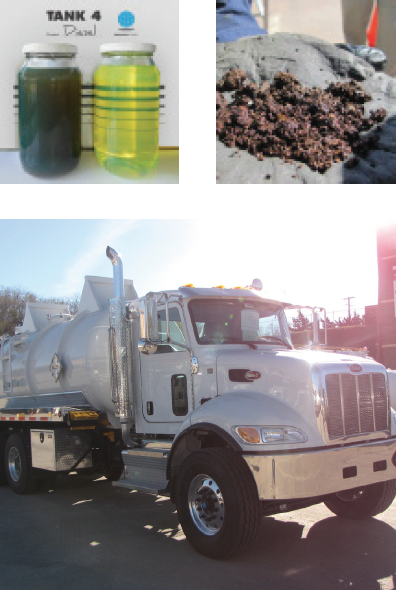 Dirty tanks, degraded fuel and phase separation are costly to your business! Leighton O’Brien’s patented fuel cleaning technology prevents phase separation, malfunctioning pumps, ATGs, blocked filters, bacterial growth and consumer damage claims. Dirty tanks or fuel that has degraded (for various reasons) can be restored to health. This market-leading technology sweeps the entire tank floor to remove free phase water from the tank - only liquid waste (not fuel) is removed from the site. Can clean multiple tank products in one day with most sites able to operate during our fuel cleaning process. The patented process is twofold, restoring fuel while cleaning the tank from contaiminants such as rust particulate, bacterial sludge and foreign matter. We return 99% of your cleaned fuel back to the tank preventing large fuel losses and report the waste removal amount for accurate inventory management and reconciliation. NOW OFFERING VAC TRUCK SERVICES! New to WildcoPES, with our Vac Truck services, we can handle all of your waste removal needs. Tank cleaning and fuel polishing has evolved significantly over the last decade. In years gone by, when symptoms of water in diesel or petrol occurred, simply pumping free water from the tank floor was considered a sufficient method of fuel treatment, which slowly evolved into one of the many variants of fuel filtration.